To start with, our readers should know whether they have a genetic predisposition to diabetes. While scientists and researchers are still determining the strength of the diabetes/genetics link, knowing your family history is half the battle. Type 2 diabetes is known to have a strong genetic connection. The other half of the battle are “modifiable lifestyle risk factors,” and yes, this includes your diet. In fact, lifestyle may be more influential than genetics, especially for Type 2 diabetes, which by far is the most common. 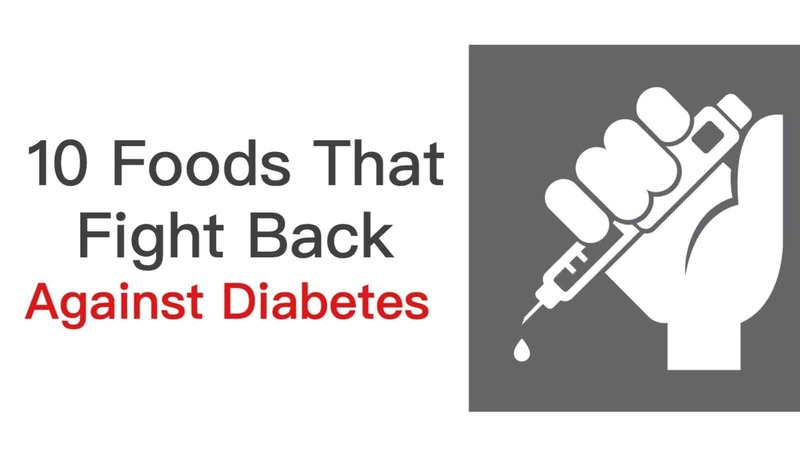 In this article, we discuss ten foods that can “fight back” against diabetes. We’ll also discuss some of the science behind it. Blueberries are considered a “superfood,” food that is extremely nutrient-dense. Blueberries are potent diabetes-fighters; a natural chemical found in blueberries shrinks fat cells and stimulates the release of a hormone that helps regulate blood glucose levels. A protein hormone called adiponectin, which blueberries are a rich source of, can maintain low blood sugar while increasing our body’s sensitivity to insulin. Heart disease is the number one cause of death for people with diabetes, which makes broccoli’s inclusion on this list mandatory. Like blueberries, it too is considered a superfood – and a potent anti-diabetic source. Broccoli is rich in sulforaphane, a compound that initiates multiple anti-inflammatory responses that maintain blood sugar levels while protecting blood vessels from diabetes-related heart damage. This treat is not only shown to increase satiety, but it is also rich in nutrients that ward off diabetes. One class of nutrients, flavonoids, help reduce insulin levels, improve insulin sensitivity, and reduce insulin resistance. Flavonoids found in dark chocolate have also demonstrated to lower blood pressure and lessen the risk of both heart attack and stroke. Olive oil is a known staple in Mediterranean-style diets; which may reduce the risk of type 2 diabetes by nearly 50 percent. Olive oil is also considered the healthiest of monounsaturated fats and enhances satiety more than butter, lard, margarine, and canola oil. Rich in antioxidants, olive oil also safeguards cellular health by fighting off free radicals and promoting heart health. Many types of seafood are excellent choices for diabetes, but fish reigns supreme because of its nutritional density and breadth. Fish is low in unhealthy fats, trans fat, and cholesterol. The fat within fish is of the healthy, unsaturated variety and contains a bounty of Omega-3 fatty acid. Also, fish is high in protein and contains zero carbohydrates; the latter helps to stabilize blood sugar levels. The best fish choices for diabetes includes albacore tuna, halibut, herring, mackerel, salmon, sardines, and trout. Cinnamon is not only a delicious spice, but it also contains some potent anti-diabetes properties, especially for lowering blood sugar levels. In addition to dropping blood sugar levels, cinnamon improves the effectiveness of insulin. Tertiary benefits of cinnamon include neutralization of free radicals, anti-cancer properties, and anti-inflammatory properties. It’s ability to decrease “systematic inflammation” further protects you from diabetes. Spinach is another superfood with some incredible nutritional benefits. Spinach is an excellent source of alpha-lipoic acid (ALA); one promising area of ALA research focuses on the acid as “a possible alternative remedy to treat the pain associated with diabetic (neuropathy).” Neuropathy is a form of (often painful) nerve damage and often complicates diabetes and diabetes-related treatments. ALA also reduces blood sugar, cortisol (the “stress hormone), and inflammation. Walnuts contain a fatty acid, alpha-linolenic acid, which has demonstrated anti-inflammatory traits. Additionally, walnuts contain numerous other properties that ward off diabetes. In a 140,000-person study, published in the Journal of Nutrition, participants “who consumed a 28-gram packet of walnuts at least twice a week were 24 percent less likely to develop type 2 diabetes.” Walnuts are also believed to protect against arthritis, heart disease, and cancer. Sweet potatoes, unlike various other starches, have a much lower glycemic (read: sugar) index. In fact, moderate consumption of sweet potatoes can stabilize blood sugar levels. Standard diabetes tests indicate that the food reduces fasting blood glucose. 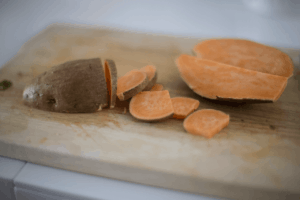 Anthocyanins, a flavonoid that gives sweet potatoes their orange hue, assist with warding off viruses and inflammation. Yeah, this is a new bean for me too. Cannellini beans are white beans with some incredible health benefits. 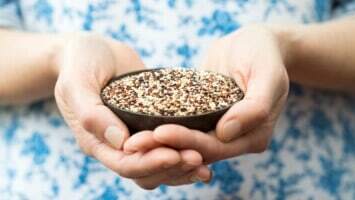 In a 2012 University of Toronto study, 121 people with type 2 diabetes saw their average blood sugar levels drop nearly 200 percent more than the whole-grain control group. Cannellini beans are also rich in protein and soluble fiber – a fiber source that lowers bad cholesterol levels.